Minimum billing is for 4 hours. All bookings between 1 to 3 hours will be billed at 4 hours. A fully refundable security deposit of ₹ 5000 will be charged at time of booking. Only valid on bookings made through Zoomcar website and iOS/Android app.Discount applicable only on original reservation charges (not applicable on excess Km, late return fee, or other fees/charges). Discount applicable only on original reservation charges (not applicable on excess Kms, late return fee, or other fees/charges)Offer not applicable on blackout days. 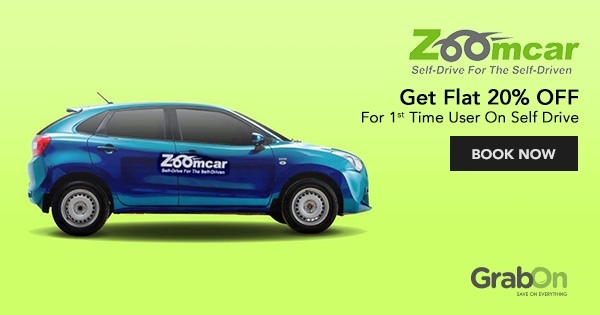 Avail Flat 20% off on self drive auto rentals at Zoomcar. Get this offer on installments just through Rupay credit/charge cards. A refundable security store sum will be charged amid booking an auto for rent. Now subscribe to Zoomcar ZAP subscribe and avail all the brand new cars directly delivered from the showroom. This offer can be used and applied to monthly packs, 6 months, 12 months and 24 month plans. These cars are available with No EMI's, No loan, No Downpayment, No Maintenance or Insurance required. This offer is also available for flexible packages and shift of plans are also accepted. Zoom Car On-time delivery offers a free delivery to your doorstep in time. Avail flat Rs 500 off on your booking when the car is not delivered in time. Flat Rs 250 refund and Rs 250 Zoomcar credit points. These offers are applicable only in select cities like Bengaluru, Hyderabad, Pune, Mumbai, Chennai only. This offer expires soon. So grab now. Zoomcar Promo code is not necessary for this type of offer and is valid for all users. Zoomcar introduces an incredible weekly package for Pune users where you can get a Zoom car for as less as Rs 600 per day. You can get your favourite car from Sunday till Friday and get done with all your personal, official works with a great comfort and style. This is a limited time offer so hurry up and grab this incredible offer now. Please check the details and available slots of booking the Zoomcars on the landing page today and grab this limited period offer now. This offer is soon to be ending so go for it today. Get Rs 2000 off on bold Nexon automatic car. This offer is applicable for every month subscription. Valid till the stock lasts. Applicable across all tenure plans. Up to 60% off on daily deals at Zoomcar for car rentals. Select cars from Ford Figo, Ford Eco-Sport, Mahindra XUV, Maruti Swift, BMW, Mercedes and lots more. Offer applicable on Monday to Thursday booking. Applicable on First Drive, SUV's and Sedan Cars Only. Zoomcar brings new deals every day exclusively for Pune users, where You can get up to 50% OFF on pre-selected deals. You can select all the vehicles from all the widely available categories like Hatchback, SUV, Sedan, Luxury Cars. Maximum booking duration in these deals is 48 hours and you can find deals of about 3 days in advance. These offers will get refreshed every day at 8 PM. No Zoom Car Code is Required. This is valid only during weekdays (Monday-Thursday). Please follow the landing page for more details,instructions, terms and conditions. Grab the discounted prices on cars only during weekdays. Zoomcar Zap Subscribe offer: flat Rs 350 cashback offer upon subscription. This is applicable to the first time usage and cannot be clubbed with any other offer. Zoomcar is a car rental company that provides self-drive cars. Why choose cars with drivers when you can have the entire car to yourself? The cars can be rented on an hourly, daily, weekly or monthly basis. From family cars to luxury cars like sedans, the company has it all. The per day charges start at nominal rates which includes fuel, insurance, and taxes. Zoomcar is present across all major Indian cities like Delhi, Mumbai, Chennai, Bangalore, Hyderabad, and Pune. The self-drive cars from Zoomcar are ideal for weekend family trips, business meets on the weekdays and a get together with friends. How Does Zoom Car Work? The user needs to select the car and upload documents like license and ID proof along with a security deposit. Zoomcar will send an SMS to the users 20 minutes before departure. This SMS will contain pickup destination, car model & registration number along with the unlock password. The user can then unlock the car, fill in the details and take the car for a ride. Buying a car involves maintenance, insurance and EMI costs which are skyrocketing often. With ZAP or Zoomcar Associate Program, the user can share their car liabilities and cost whenever they’re not driving it. Zoomcar suggests listing a car on ZAP for just 15/month can reduce the EMI by 70%. Users don’t have to worry about the health of the car, as Zoomcar’s proprietary car monitoring service Cadabra tracks vital signs (clutch, brake and accelerator usage) and sends it to the user. GPS tracking further ensures the safety and security of the vehicle. Why Should You Use Zoomcar Promo Code Through GrabOn? Whether you are a new user looking for the first ride coupons or an existing user browsing for exciting offers, GrabOn is the place to be. All the coupons displayed on the platform are handpicked and curated carefully before validating them. You can avail discounts on payments through mobile wallets like Paytm Zoomcar offer and save on your car rentals. Apart from coupons and offers, you can earn cool referral points as well if your friend is a new user. Zoomcar enjoys immense popularity on the social media channels evident by over 560,000 followers on Facebook, 13,000 followers on Twitter and close to 50,000 followers on Instagram. Self-drive car rental platform based out of Bangalore has reported a significant hike in its operational revenue from Rs 118 crore to Rs 155 crore during 2017-18. Operational across 45 Indian cities, Zoomcar started its cycle sharing service in 2017. On the occasion of India’s 70th Republic, Zoomcar co-founder Greg Moran extended his solidarity towards the economically underprivileged sections of the society by distributing 500 cycles in cities like Kolkata, Pune, Chennai, and Bengaluru in hopes of alleviating the transport problem and address other key issues. How To Use ZoomCar Coupons ? Zoomcar is India's first 100% self-drive car rental company which allows you to rent cars by the hour, day, week, or month — it's like having your own car, anytime you need. They provide awesome selection of hatchbacks, sedans, SUVs and Luxury cars. Prices start at just Rs. 49/hour and include fuel, insurance, and even taxes. If you're looking for a self drive car, Then book a car at ZoomCar and enjoy a comfortable drive across a wide variety of places from Bangalore. Choose from a wide range of Top class cars such as Mercedes A Class, Vento, Figo, Ecosport, Scorpio, City, E20, 3 series and much more. Chuck out the hassle of owning a car while enjoying the pleasure, mobility and great convenience on a variety of cars with Zoom Car. So go anywhere booking their car rental service on hour, day, week or month basis. Would you want to zoom? Just follow 4 simple steps -- Book, Pay, Zoom and Return. Browse all their special discounts and offers here. Zoomcar service is available in multiple cities - Bangalore, Pune, Delhi, Mumbai, Chennai and Hyderabad as well.